Chromebooks are great if you want a super cheap computer, but they're not without their limitations; you (basically) have to run everything in a browser. And Microsoft is aiming to give them some competition with full Windows 8 machines around those same, dumb low price points. 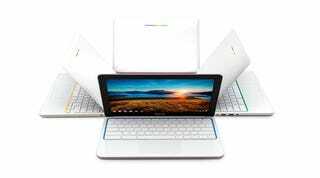 Today at the company's partner conference, Microsoft announced that HP is working on a $200 Windows 8 laptop for this coming holiday season, with options from Acer and Toshiba that are in the $250 range. There's no word on the HP device's internals, but the Acer and the Toshiba will offer 11.6- and 15.6-inch displays respectively, and run 2.16GHz Intel Celeron processors.